Use this kit to earn all four Daisy Leaves*! *GSUSA® feels that this product was infringing on their intellectual property. In response, we are discontinuing this product. Supplies are limited. 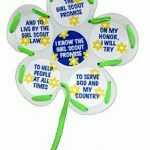 Age appropriate activities for all 4 of your Daisy Leaf Awards*! 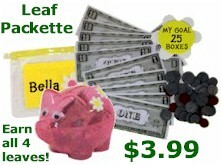 2 reviews for "Leaves Packette"
This kit includes enough of what you need to help the girls earn all 4 leaves. I would like to add a tip of making sure you read the instructions a few weeks’ prior to using this at a meeting so you can have an idea of what the girls will be putting together. 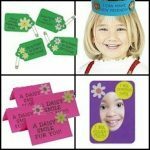 I did place a 2nd order with MakingFriends before we had our meeting and went through their lower cost items to have available at our “shop” for the girls to buy with the play money. They just absolutely loved that idea. Shop items included: Snow globes, stickers, also had signs that were for more than they had like an iPad, vacation to Walt Disney world for a family of 4, etc. So we talked about saving and spending money. I would agree with the other review that the plastic bags and the plastic piggies were mid-to-poor quality but on the flip side – the girls were able to open the piggie bank easily to get the money out. And with the plastic bags that hold the money – I think it’s a hit or miss situation. We did have 1-2 of them, but luckily I had enough, as I ordered a few extras so it worked out well. I don’t like to say negative things but, to be honest, this Packette was a little disappointing. I love the activities presented to earn the leaves and the supplies would be perfect to carry them out but the quality was poor. The piggy banks wouldn’t stay together so my girls used tape to assemble them. The zips on the money bags wouldn’t stay closed and in some cases came off altogether. I am a HUGE fan of MakingFriends and will continue getting my supplies here. I don’t think this is representative or the retailer, More so a problem on the manufacturers side.